Home » EV Technology » Will Plasma Jet engines ever replace fossil fuel? Will Plasma Jet engines ever replace fossil fuel? One of the heaviest consumers of fossil fuels in the transport industry are jet aircraft. Following the fuel price volatility of 2008 which contributed to a large number of airlines filling for bankruptcy and the impending introduction of carbon tax, much effort is being applied to the development of bio jet fuels. Anything from coconut oil to Algae is being developed , any of which may or may not be harvestable in the volume required by the commercial airline industry who consume 18.85 billion gallons of jet fuel, or approximately 449 million barrels each year. We have recently seen an increasing number of electric powered aircraft being developed. Using either small battery packs or fuel cells for energy storage, sometimes combined with solar cells for in flight charging. Unfortunatley the only practical way to propel an aircraft at the moment with electricity is to use a propeller. While Props might be acceptable for single seater and low speed aircraft they will never provide air speed comparable to a modern day jet engine. So the question can be asked, is there any EV alternative to the fossil/bio fueled jet engine? There are several approaches used to convert electric energy directly into trust. 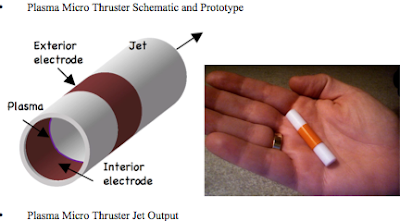 As part of a DARPA Nano Air Vehicle (NAV) Program, researchers from the Oklahoma State University have developed a Plasma Micro Thruster approx the size of a cigarette. 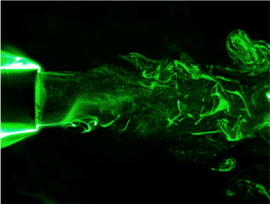 Because it is practically impossible to develop micro (defined as less than 7.5 cm) unmanned aerial vehicles by using moving parts, they have built a small jet propulsion system that produces thrust by accelerating plasma material between two electrodes. Also known as plasma actuators or dielectric barrier discharge actuators, they consist of two electrodes separated by dielectric material. A form of magnetohydrodynamic propulsion, a low temperature plasma acts as the 'fluid' or hydro part of the device. Most of these types of plasma jet engines, as is the case with all magnetohydrodynamic drive systems, are extremely inefficient producing only very small amounts of thrust due to hall effect losses. Another still theoretical approach we've concocted here at EV News HQ is a plasma jet engine based on a conventional turbojet. Making use of the multi-stage compressor and expander sections of a regular jet engine, a plasma jet replaces the fuel combustion stage with an electrically driven plasma ignition stage. A good example to demonstrate the principle is a typical hand held plasma cutting torch. Compressed air is supplied by an air compressor at around 90 psi (Coincidentally many jet engines produce around 90psi after their compressor stages ) which is forced through a very small opening in the torch nozzle with an electric arc applied to ionize the airflow. The combination of arc and high pressure/small nozzle creates a supersonic (9,000 mph) superheated (25,000 F) plasma stream that in a plasma cutter application vaporises steel and in a jet motor could replace the fuel combustion process. There are various ways to generate a plasma but one method is to replace the combustion cans, that reside after the turbojet compressor stage, with anodes/cathode combustion chambers to superheat the compressed air entering the combustion stage and expand the gas out through the exhaust turbines much the same as a normal jet engine. This could allow jet aircraft to move from fossil or bio based fuels to electric power, provided the system is more than 40% energy efficient of today's commercial jet engines. Of course, there are huge challenges in the bulk storage of electrical energy on-board aircraft, but with current battery technology developments working towards a 40 fold increase in battery energy density, plasma jet aircraft may be here sooner rather than later.